Security on a completely new level. 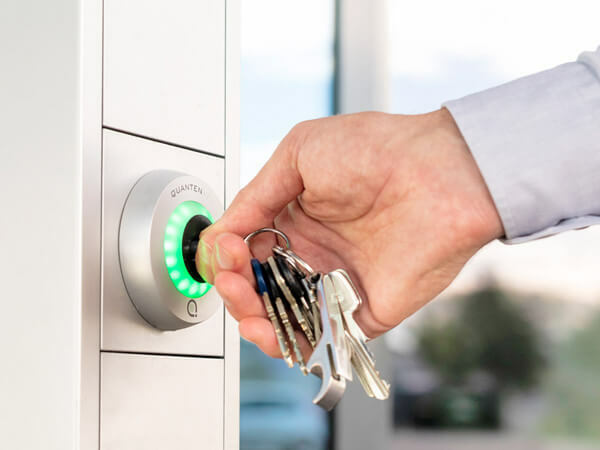 The quantum key system ensures your security and that of your assets in the area of access control, alarm management systems and high-security systems. The Quantenkey stands for absolute espionage protection, with an unbelievable coding depth of approx. 900 billion code combinations, robustness, flexibility as well as user-friendliness, because it combines the advantages of the physical world with the digital one. Security developed further. 900 billion code combinations, absolute read out protection and a high level of robustness provide a new level of security. 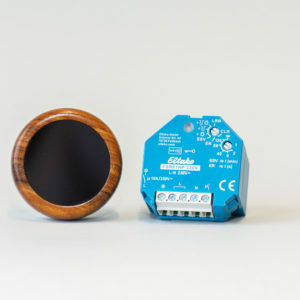 High-quality materials and a sophisticated coding and reading process enable the reading units to read the Quantenkey even after strong physical interference. Insert, enter – high user-friendliness through simple handling and extreme flexibility through individual configuration options, made possible by a new technical procedure. 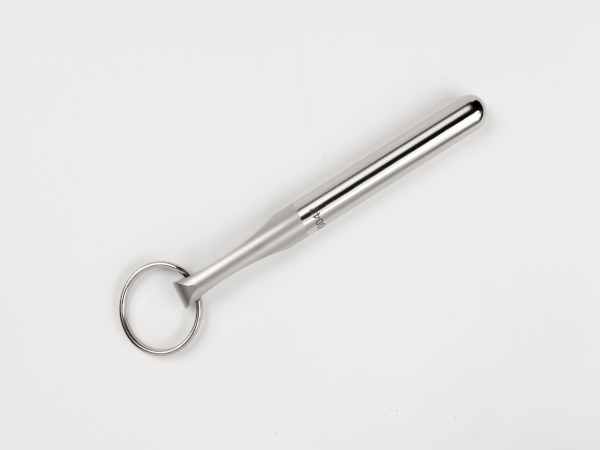 The eight-centimeter-long stainless-steel key sets new standards in ease of use. 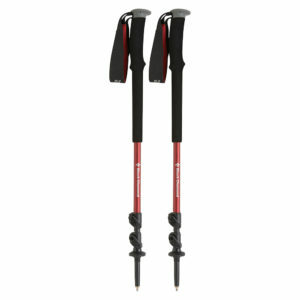 The Quantenkey can be easily and effortlessly inserted into both reading units. 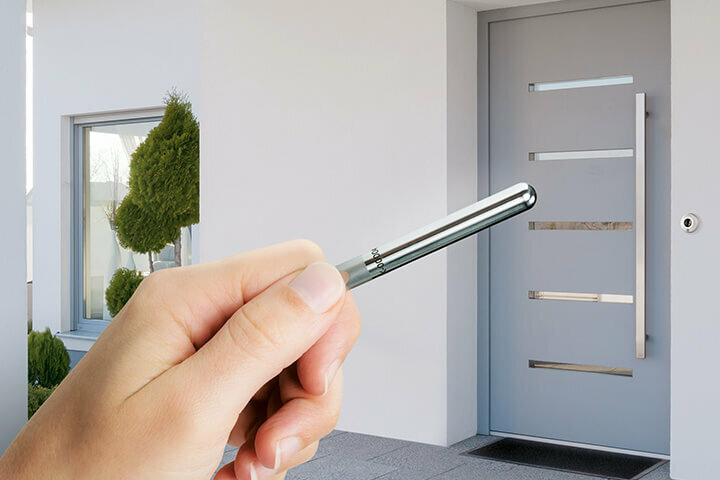 Since the key is read out automatically during insertion, the Quantenkey system releases the door depending on reading unit, only after authorization or after correct parallel code entry. 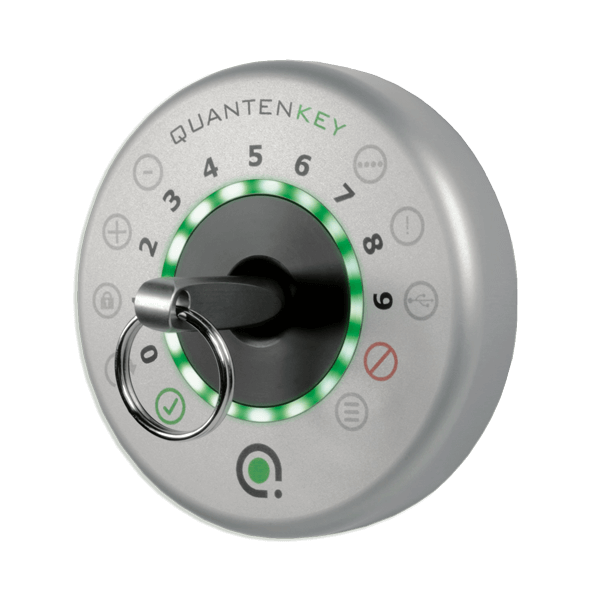 Since the Quantenkey system combines the advantages of the physical world with the digital one, the same quantum key – even with the system variant for single-door applications – can be authorized for use on countless other reading units. This means you can use the same Quantenkey you use to open your front door as the key to your office and, if necessary, your safe. In each individual case, different authorization configurations can be stored in the digital system of each reading unit. You will find information about the different configuration options, such as the authorization within defined time windows, the possibility of using the key with another parallel code and many more, in the descriptions of the application areas. A little gem and your key to the future. Robust, slim, high-quality, that’s how the quantum key feels in your hand. It represents your own very personal identification, because each Quantenkey is unique. Forged for eternity, the high-quality material defies all environmental influences. Even salt water, mechanical damage, EMC effects or strong magnetic fields cannot affect the readability of the key. The coding is deep and secure in the crystal lattice structure of the precision processed stainless steel. Because of the special coding method by which the code is introduced directly into the crystal lattice structure, the Quantenkey has no visible or copiable features. Since the key itself is passive and does not emit any signals, it is also absolutely secure against eavesdropping. 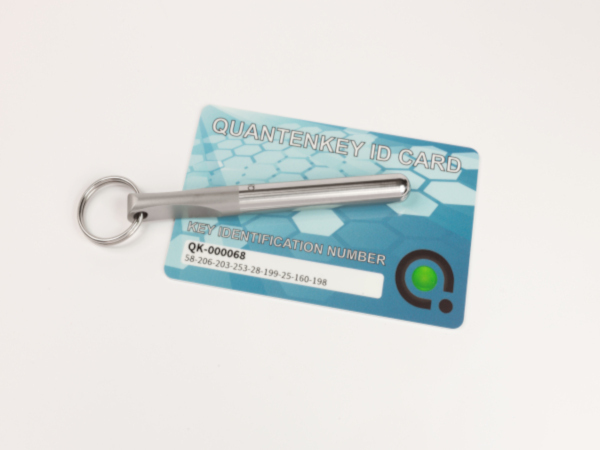 Therefore, the Quantenkey ensures complete security and function even under the most extreme conditions. 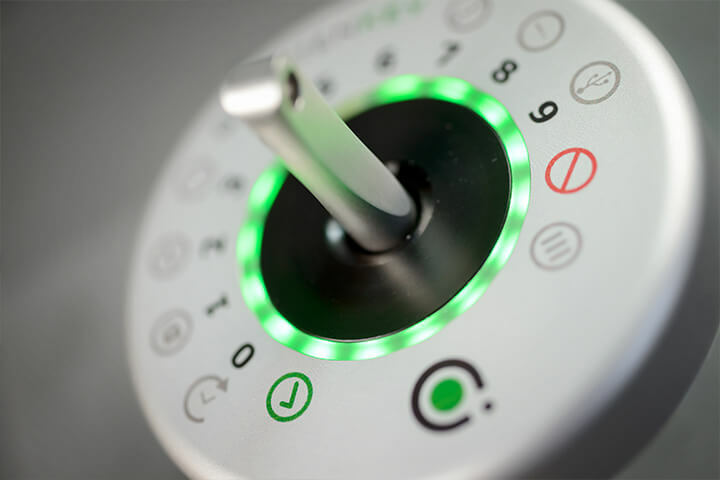 As a key of the future, the Quantenkey features a haptic without corners and edges. 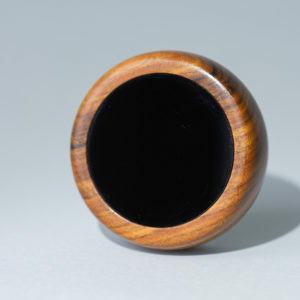 Smooth, round and without a visible key code. With its massive stainless-steel body in a minimalistic design, the Quantenkey is high-quality, lays comfortably in the hand and offers maximum security and absolute copy protection and privacy via the revolutionary encryption process at a crystal lattice structure level. 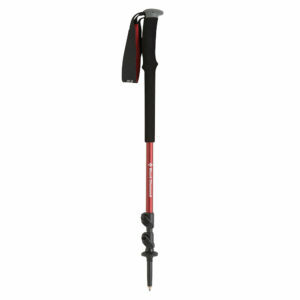 Designed for fast and secure access. 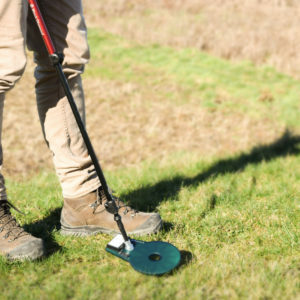 Comfortable insertion of the key in the round opening of the reading unit – without the need for fine motoric. 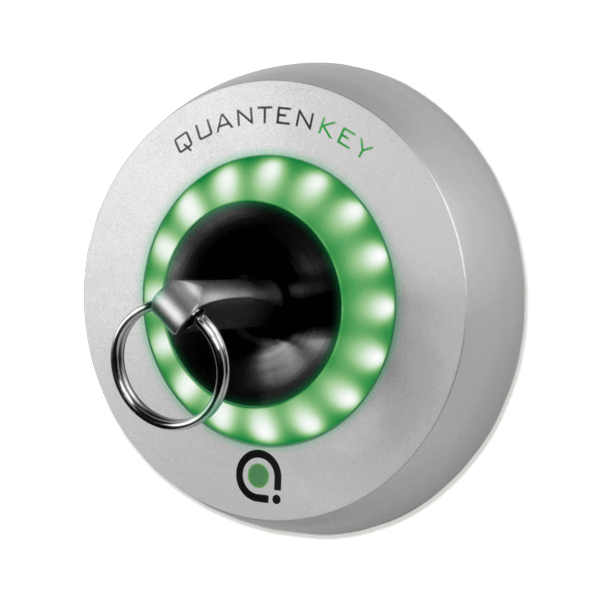 By authorization of the Quantenkey, the warm white LED ring turns green, and the electro-mechanical locking system is activated to open the door. 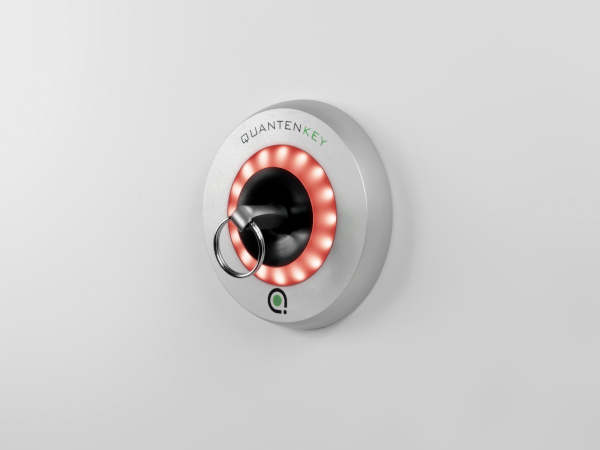 When a Quantenkey without access authorization is used, the warm white illuminated LED ring turns red and the door remains closed. The high quality, minimalistic design integrates perfectly into modern architectural facades of different materials. The subtle lighting of the LED ring, means that you no longer need to search aimlessly for the keyhole in the dark. The Quantenkey Reader for access control is designed for wall mounting in a standard flush wall mounted enclosure. Designed especially for applications with extremely high security requirements, the reading unit with parallel code input allows for the additional input of a personal PIN. Comfortable insertion of the key in the round opening of the reading unit – without the need for fine motoric. As the Quantenkey is inserted, the coding is read. After correct PIN entry and confirmation, the LED ring lights up in green and the electro-mechanical locking system is activated. 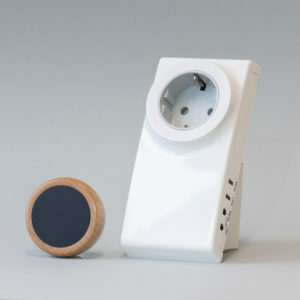 When a Quantenkey without access authorization or the wrong PIN is used, the warm white illuminated LED ring turns red and the door remains closed. 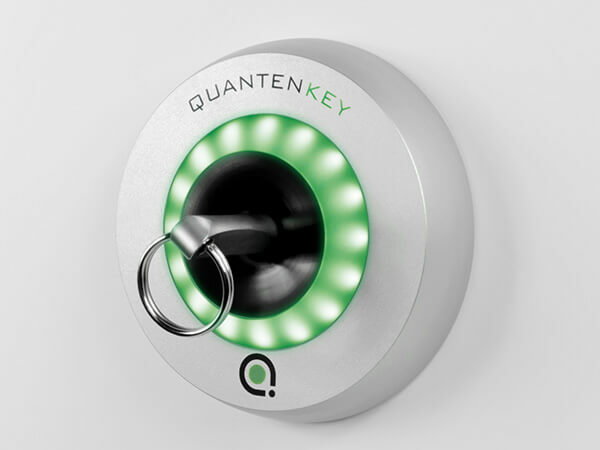 The Quantenkey can be installed both as a stand-alone system or be integrated into a common Smart-Home solution. Benefit too with the stand-alone application from the countless possibilities in the digital world. The system can be fully configured by utilizing an App for your Android Smartphone and software for your desktop. 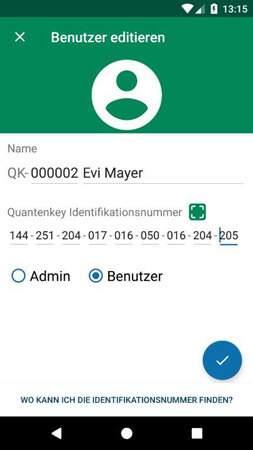 Available in the Google Play Store, the “Quantum Access Manager – the Smart Access Management” User Management and your access privileges are intuitive and easy to manage with the Android App “Quantum Key Access Manager” and Reader. Permission changes such as adding users, deleting users, and many more options can be managed with your “adminkey”. 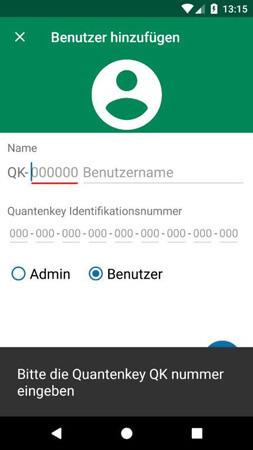 Thanks to the secure transmission communication established with the help of the Secure Communication Key (SCK) and your reading unit, the App offers additional security – and all without a wireless connection! 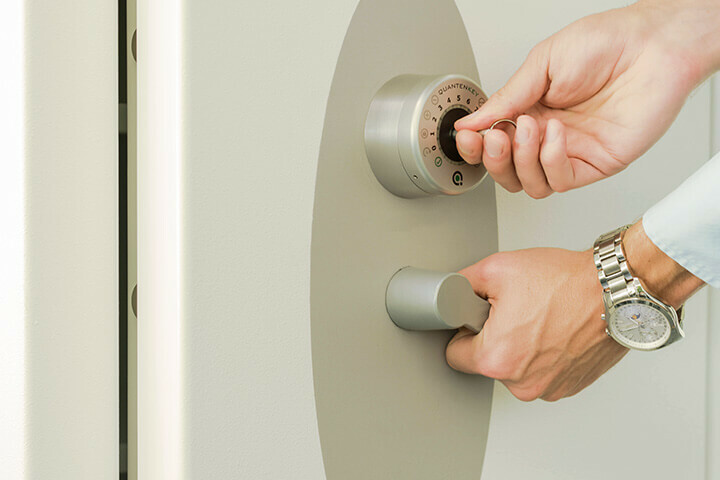 Discover the benefits of this administration – from the analog to the digital world of security.